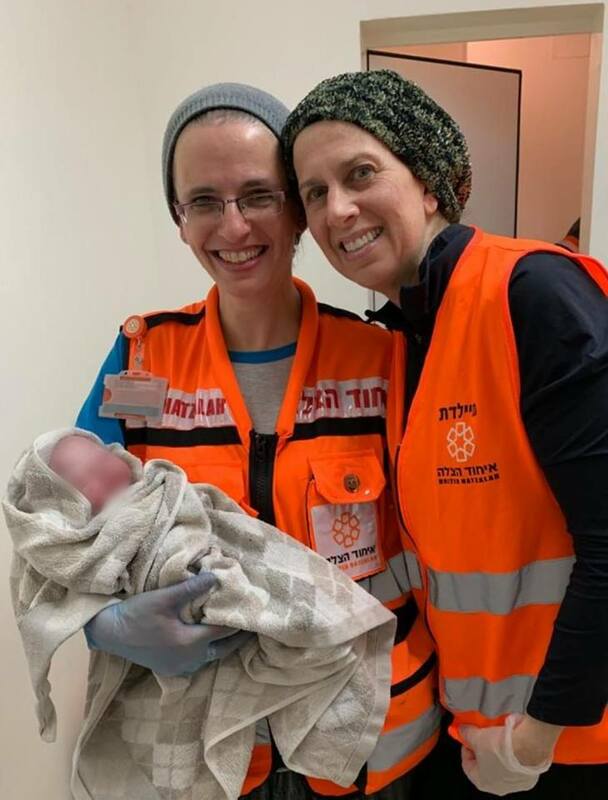 At 4:48 a.m on Sunday morning, United Hatzalah volunteers in Beit Shemesh were alerted to an emergency via the Health Ministry’s new application. Two volunteers from the women’s unit of the organization as well as one volunteer from the Midwives unit rushed to the scene to assist a woman in active labor. The incident took place very close to where the responders lived and the first responder was in the door in less than 90 seconds. The women were Elky Grossman and Ruthie Prince, and the Midwife was Allison Rosenbaum. Another EMT arrived and received an update from dispatch that the ambulance was coming from Jerusalem. After relaying the information to the women, he stepped outside of the room and let the women do their work in assisting the mother. The woman a well as her husband were a bit panicked as they had hoped to deliver the baby in the hospital, but seeing as the ambulance would not be arriving for a while and that the baby was progressing, the birth needed to happen at home. Allison Rosenbaum who works as a Midwife in Assuta Ashdod and assists in between 10-20 births per week headed the team. Rosenbaum said: “The thing that nicest was that it was a team of women helping the mother. It gave a sense of calm to the mother that we were able to be there and help her. My main goal is to make sure that the babies and mothers are okay and healthy. Today’s birth was fairly straightforward and we were happy to be there to assist especially as it took so long for the ambulance to arrive. This entry was posted in Uncategorized and tagged Ambulance, Beit Shemesh, birth, Childbirth, EMT, Israel, midwife, mommy and baby, United Hatzalah, Women, Women's Health, Women's Unit. Bookmark the permalink.